Our Beliefs | About Us | Centurion Asset Management Inc.
Thousands of Canadian families rely on us to help them meet their savings and retirement goals. 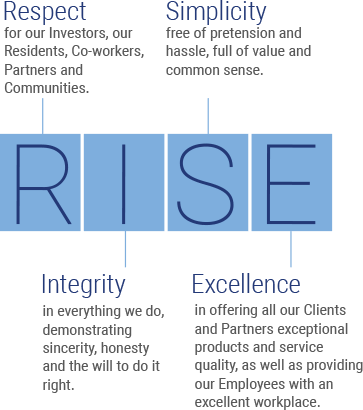 It is through focusing on the needs and well-being of our Residents, Clients, Partners, Employees, and Communities, in addition to those of our Investors, that we will be able to deliver on our mission. Our Corporate Values guide our business practices and strategy to effectively serve our stakeholders. To embrace change, experimentation, innovation and learning from failure to make continual improvements that drive our success and keep us ahead of our competitors.